149mpg Volvo on sale by 2012 | What Car? Volvo is putting the finishing touches to a 149mpg hybrid version of the V60 estate ready for public launch towards the end of next year. With the capability to cover up to 31 miles on electric power alone, its official CO2 figure will be just 49g/km way below any other car with an internal combustion engine. The hybrid is based on the most powerful D5 five-cylinder diesel V60, but it also has a rear-mounted electric motor to give a power boost and all-wheel-drive capability when needed. The car will be the centrepiece of Volvo's stand at the Geneva motor show next week. Volvo chose the V60 as the basis for its first hybrid because the impact on luggage space is less marked with an estate than with a saloon. A little over a quarter of the standard boot is lost by the need to raise the luggage deck to make space for the motor and batteries. The decision to go down the more complicated route of making a diesel hybrid rather than one with a petrol engine was taken to maintain the standard 1800-kilo towing capacity. Volvo claims the hybrid V60 will be able to accommodate five people and still carry 80 kilos of luggage. 'We wanted people to be able to live the life they had before as much as possible,' the company says. The diesel engine develops 215bhp and 325lb ft of torque, but the electric motor can boost this by a further 70bhp and 148lb ft on demand. The car gives drivers the choice of three operating modes, and accelerator response and the shift pattern of the six-speed automatic transmission will vary according to which one is chosen. The default setting is Hybrid, where the electric drive will be the dominant source of energy, with the diesel cutting in only when extra power is needed or battery power is getting depleted. At the touch of a button drivers can choose Pure, which activates all-electric zero-emissions running, although the diesel will help out when necessary, such as when kicking down to overtake. Power mode switches on the diesel engine and makes the motor available as an extra power source. Drivers will be able to turn on the electronic all-wheel-drive system in all three modes to increase traction in slippery conditions, and it will function even if the battery is flat by drawing power from an on-board generator. Volvo says the car's unusually large 12 kilowatt-hour battery pack is key to its impressively long range in all-electric mode, although this is at the cost of boot space, which is modest for an estate car. 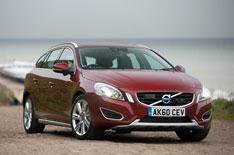 It also adds considerably to weight the hybrid V60 comes in at two tonnes. Volvo claims the car has an overall range of up to 750 miles, a top speed of 125mph (62mph in all-electric mode) and will cover the 0-62mph dash in 6.9 seconds. A full recharge of the battery will take around 4.5 hours through a 240-volt domestic socket. The V60's structure has had to be modified to accommodate the hybrid drivetrain components, and Volvo admits the combined changes will make it an expensive car. By opting to make a diesel hybrid, sales will be restricted to Europe, although Volvo plans to make petrol hybrids for the USA and the Far East later. 'We knew that if we could solve this one (a diesel hybrid) we could fix anything,' a leading member of the development team said. Volvo is currently not satisfied with the smoothness of the driveline, which has to deliver a lot of torque seamlessly from standstill and then again when the diesel engine cuts in, but it has 18 months to get things right before the car goes on sale.